The government immediately reacted with slander, declaring that they were “dealing with crooks”, who were after more money than they were entitled to. The dispute centres on allowance schemes, which allow the workers to claim for uniforms, being on call, and other expenses. After just three days, the union reached a deal with the government, which was immediately dismissed as a “betrayal” by the rank and filers, who pressed on with their strike action. However, the end of the week saw the government sack all 25,000 who had withdrawn their labour. Despite this, “hundreds” of their number rallied in the capital Nairobi on Friday, demanding reinstatement. 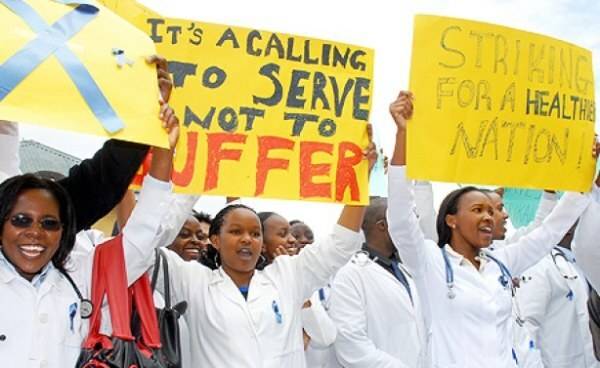 At the start of the strike, assistant medical services minister Kazungu Kambi claimed he had thirty thousand applicants waiting in the wings to replace the strikers. The sheer convenience of this number makes it highly dubious, and of course any aspiring strikebreakers would have to be trained up first. Nevertheless, the road ahead looks like a tough one for the health workers. In the coming days and weeks, they will need to set up a united and democratic organisational structures independent of the trade unions, and make an appeal to the wider working class. This struggle looks like one to keep an eye on.